This is the first part of an old piece of writing I produced back when I was considering trying to write a book for children. I can see a lot of problems with it, but I think it's worth posting just for the fun of the "Moorhouse Mouse's Mouse House" title. I imagine the sequel would probably involve Moorhouse finding a wife ("Moorhouse Mouse's Mouse Spouse"). Farmer Budd was a fat old man who lived with his wife on a little farm in the countryside. He was a friendly chap, but he didn't like mice. 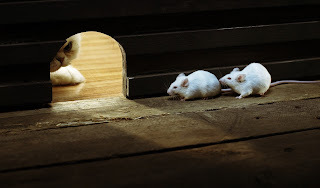 Mice ate his stores of grain and, as he often said to his wife, he really did not like the way they left their droppings all over his nice clean farmyard. "Let's get a cat," said Mrs Budd. So they did. Battered Tom arrived at the farm in a cardboard box. At first he was just called plain old "Tom" but after his first skirmish with Angry Gilbert, the farm's prize pig, the poor cat had earned himself a broken ear and a squinty eye. Good old Battered Tom; he was a lovely cat but he never did manage to catch any of those mice. Perhaps I should explain who I am? I'm Jon, the farmhand. That's me over there – the young lad with the pitchfork. I've just finished cleaning the horses out for the day and, let me tell you, it's backbreaking work. It's a good life here on the farm though. Farmer Budd lets me sleep in the stable and Mrs Budd always makes sure I have more than enough to eat. Sleeping in the stable might sound a bit rough but I like it. If I didn't sleep in the stable I might never have met Moorhouse Mouse. And if I'd never met Moorhouse then life would have been a whole lot less interesting. Moorhouse started life as just one of fifteen baby mice. That's a big family! They all lived in a tiny nest hidden behind the skirting board in the farmhouse kitchen. Just imagine growing up in the dark surrounded by fourteen brothers and sisters. When I first met Moorhouse he was a very young mouse living in that very crowded mouse hole. Back then he wasn't called Moorhouse. In fact, he wasn't called anything at all. You see, mice do not get their names in the same way we get ours. You and I were given names by our parents long before we were even old enough to know about it. Not so with mice. When they are old enough to go out into the big wide world on their own, they choose names for themselves. Now Moorhouse was a brave little mouse and so one day he crawled to the edge of the nest and peered out. Everything was dark except the half-circle of light that was the entrance to the mouse hole. Outside that hole, all manner of strange and exciting things seemed to be happening. He could hear strange noises and smell all manner of wonderful smells. His mouth watered at the thought of eating whatever it was that smelt so delicious. Bravely he clambered out of the nest and towards the hole. He peered out into the light. It seemed very bright and busy out there. In the distance he could just about make out Angry Gilbert rooting for truffles in the farmyard.